胡斌, 男, 博士, 副教授, 主要研究方向为应用密码学、网络与信息安全。E-mail:tinrant@163.com. Objective A new type of chaotic map is constructed that focuses on the comprehensive application of nonlinear methods, such as mapping, transformation, and operation in image encryption. 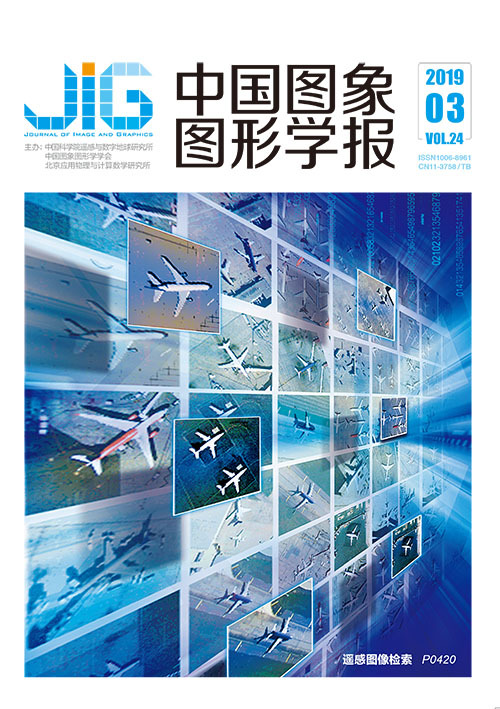 The popularity of communication infrastructure and the rapid development of network technologies have made information exchange and sharing around the world more frequent and faster. In the meantime, security problems represented by information theft, leakage, and loss are more serious. As image is the main form of information carrier, image security is a major issue in information security. Under threats of multiple information risks, image encryption is an important means to ensure the security of image information. Image encryption is an important content of digital image processing and is also one of the basic research fields of applied cryptography. Research on image encryption algorithm is valuable to the practice of image encryption and an irreplaceable function in promoting the cross development of digital image-processing method and applied cryptography theory. Moreover, such research has achieved significant results, and remaining problems are expected to be solved. First, text encryption standards, such as DES (data encryption standard) and IDEA (international data encryption algorithm), need large storage space and have high computational complexity. Consequently, these methods cannot be used directly for image encryption. Second, several encryption algorithms are oriented to grayscale images. 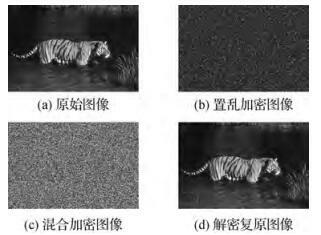 If these algorithms are applied on color images, corresponding algorithm transformation should be performed. Third, other encryption schemes, such as Arnold transform, can only be directly applied to square images. 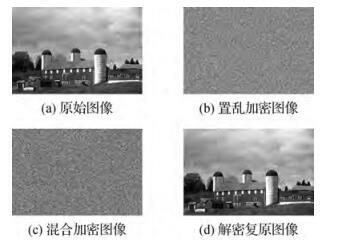 For rectangular image encryption, other technologies, such as image blocking, need to be used. These conditions invisibly increase algorithm complexity. Recently, image encryption methods, which are represented by chaotic encryption algorithms, have attracted extensive attention and achieved vital results. Unfortunately, most image encryption schemes based on common chaotic maps have been cracked. Therefore, research on new chaotic image encryption schemes is imminent. We constructed a generalized chaotic mapping based on Henon chaotic map, which is called Henon Sine (H-S) mapping, to improve the algorithm of image encryption and provide a feasible solution with effective properties for image encryption practice. Method With the use of H-S map, matrix nonlinear transformation and point operation, the inner random function of MATLAB, and rounding operation, an image hybrid encryption algorithm is proposed through sequence rearrangement and gray transformation. The encryption algorithm adopts the basic pattern of pixel scrambling and sequence transformation. The pattern comprises two stages. In the first stage, the first chaotic and the original pixel matrixes are combined and subjected to nonlinear transformation via matrix point operation. The scrambling encryption scheme of the original pixel matrix is given using random sorting of the transformation results. 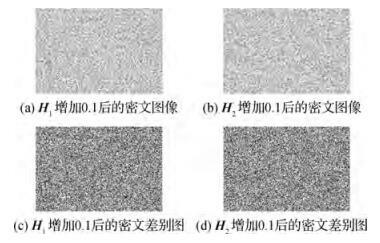 In the second stage, another nonlinear transformation with different parameters is implemented between the scrambled pixel and the second chaotic key matrixes, and a rounding operation is run to realize gray encryption. Accordingly, the decryption process is performed using the inverse operations and transformations in the contrary order. That is, the pixel sequence decryption is performed by applying the inverse operation of the pixel sequence encryption, and the inverse operation of the sequence rearrangement is applied to complete the scrambling decryption. Result To verify the security and effectiveness of the encryption algorithm, we carried out image encryption experiments for standard images with different sizes. The algorithm shows the feature of the one-time-pad and demonstrates perfect performance on anti-attacks due to the combination of chaotic keys, nonlinear operations, and random factors. Moreover, the algorithm has low computational complexity and is convenient for programming. Furthermore, the algorithm circumvents the reversibility requirement of the conventional chaotic encryption for mapping, and can be widely implemented on rectangular images of arbitrary size. Conclusion To evaluate objectively the performance of hybrid encryption algorithms, multiple performance indicators were quantitatively analyzed. These indicators include encryption time, image gray surface, image information entropy, correlation, and similarity of encryption and decryption images, key sensitivity, and differential attack. The algorithm performs with high efficiency given the large enough key space to resist various attacks and is sensitive to keys and plain text. The security features and robustness of the proposed encryption scheme can be effectively guaranteed. 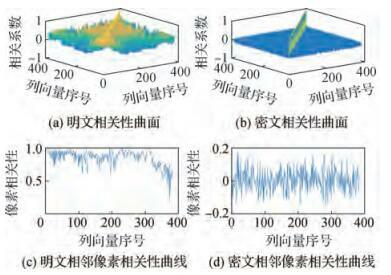 Compared with other scrambling encryption algorithms, the superiority of the algorithm is displayed. The algorithm in this study provides a reference scheme for the encryption of rectangular gray images of any size. 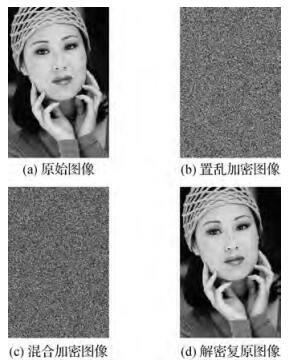 This scheme can be applied to rectangular color image encryption with appropriate adjustment. 硬件环境：处理器为Intel(R) Core (TM) i7-5600U @2.60 GHz 2.40 GHz, 安装内存为8 GB; 软件环境：操作系统为64位，Win7.1，MATLAB 2016b集成；图像来源：BSDS500(https://www2.eecs.berkeley.edu/Research/Projects/CS/vision/grouping/resources.html). Sasidharan S, Philip D S.	A fast partial image encryption scheme with wavelet transform and RC4[J]. 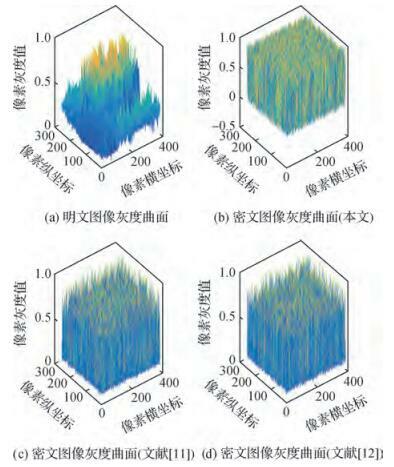 International Journal of Advances in Engineering & Technology, 2011, 1(4): 322–331. Schneier B. Applied Cryptography:Protocols, Algorithms and Source Code in C[M]. 2nd ed. New York: John Wiley & Sons, Inc., 1996: 38-144. Ahmad M, Farooq O. Chaotic image encryption algorithm based on frequency domain scrambling[J]. Information Processing Letters, 2010, 3(6): 76–82. Han S H, Yang S Y. An asymmetric image encryption based on matrix transformation[J]. ECTI Transactions on Computer and Information Technology, 2005, 1(2): 126–133. Prasad M, Sudha K L. Chaos image encryption using pixel shuffling[M]//Wyld D C. Computer Science & Information Technology (CS & IT) CCSEA 2011, CS & IT 02. 2011: 169-179.